Another part of this story that has not yet made it to my amazing blog readers is that I defended my thesis on April 30! And passed!!! That means I finish up my thesis revisions and as of this Friday I am DONE with my PhD. I'll graduate officially in August. :) This also means that I didn't have much time to work on stuff in advance as I usually do. But I started the flowers about a month ago. The bride wanted pale pink and green hydrangea, and I suggested pink cymbidium orchids as focal flowers along with some little dendrobium orchids. I had a new mini-cymbidium cutter set that I was excited about, so this was a great opportunity to try it out. This is the un-dusted cymbidium... cute huh? I kind of love it. I finished the flowers over the weekend and finished assembling the topper on Monday. And the painted/ dusted cymidium... it really comes to life, right? I had some fun figuring out how to get the fondant pearls to stay in place on the silver wires, but I thought the end result was pretty nice. As far as the rest of the cake, I designed it together with the bride based on some other ideas she liked, her wedding colors, her dress, and her number of servings. I made a mold of the brooch she wore on her dress and created a replica to be featured in the center of the bow. I finished the cake with just a few more cymbidiums on the bottom corners. The topper went perfectly with the centerpieces, and the ribbon/ brooch was a perfect match to the bride's dress. And obviously, I was really happy that everything arrived in one piece. Hi Roxanne. I just discovered your blog and I think you did an amazing job with this cake. Do you have any tips on refrigerating fondant covered cakes? Thanks, AnnaBeL! Just try to keep moisture out as much as possible. I have more trouble with cakes that are airbrushed because of the surface moisture. Just be careful you don't place them under anything that is likely to drip (like a carafe of water). I have heard that some industrial fridges can be adjusted to have less moisture content, but usually I don't have many problems. :) I like to keep the cakes cold because I work mainly with butter-based buttercreams, fresh fruit purees, etc. We could not be happier with how these cakes turned out! I love you hon!!! You are amazing!! Anyway, you haven't told us yet what your plans for the future are, now that you passed your PhD thesis. Is Engineering or Caking in your future? Beautiful wedding cake. It's really mouth watering. The floral designs and ribbon are awesome. Thanks for sharing this post to us. Wow! Such a unique wedding cake. I love it! Thanks for sharing this to us. 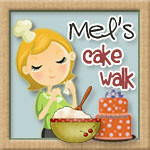 I just found your blog, and I am so impressed with your cakes. You are so talented...and to think you were defending your thesis while trying to get these flowers made. Wow!